As the International AIDS Conference (IAC) gets underway in Vienna, MSF is launching a report, “The Ten Consequences of AIDS Treatment Delayed, Deferred, or Denied," a guide to the devastation that can be expected if current trends continue. Despite the growing evidence that rapid scale up of HIV/AIDS treatment reduces unnecessary death, staves off disease, and reduces transmission of the virus, international donors are wavering and sending the message to scale back treatment plans. Yet as donors retreat from funding AIDS, progress threatens to be stopped dead in its tracks. MSF already sees the consequences of donors’ backtracking on commitments to fund expanded HIV treatment worldwide. 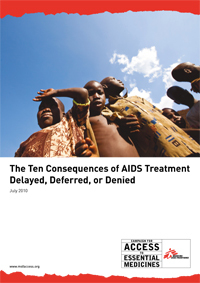 MSF is launching its report “The Ten Consequences of AIDS Treatment Delayed, Deferred, or Denied” – a guide to the devastation that can be expected if the trend continues. "We're at a fork in the road: either governments summon the political will and financial resources to treat AIDS in developing countries, or current funding for AIDS treatment stagnates, which means patients will see their treatment delayed, deferred and denied” says Dr. Tido von Schoen-Angerer, director of the MSF Campaign for Access to Essential Medicines. “It's a question of choice: if they don't help us treat AIDS, there will be more graves."